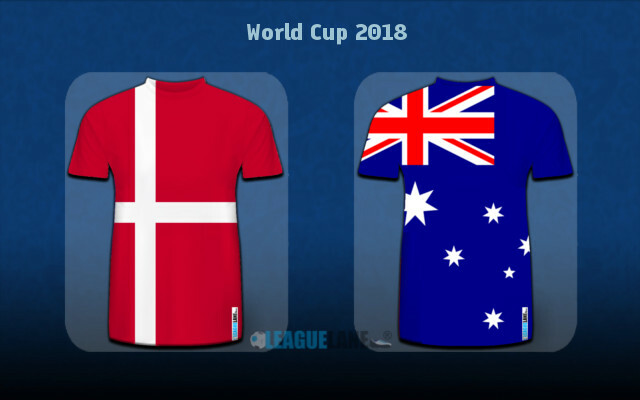 First meeting between Denmark and Australia at the FIFA World Cup. Denmark sit at top of Group C with France after the 1-0 win against Peru. Australia are the foot of the table and must win here to stay in the knockout qualification race. Denmark will qualify for the knockout with a win against Australia if France beat Peru. Denmark put themselves in the front foot for knockout qualification with the 1-0 win over Peru in the Group C opener. The Danes were under constant firing from the kick-off and the Peruvians had a couple of penalty shouts before eventually getting one close to the half-time whistle which was shot over by Cristian Cueva. Yussuf Poulsen, who conceded the penalty then turned the saviour by finding the net with a sublime finish at the hour mark, and Denmark neutralize further threat from the South Americans. On the other hand, Australia worked so hard and were edging closer to a vital point before a miscued strike from Pogba gave the French side a 2-1 win. The Socceroos head-coach Bert van Marwijk will have some complaints with the final score-line as it as a mistake from VAR than handed the Les Bleus a penalty to score the first goal. In short, on another day, his team should have ended up with a clean sheet and three points in the bad against one of the best teams in Europe. Age Hareide’s men are level on points with France in Group C. Meantime, Australia at the foot of the table and could be eliminated from the competition depending on the result of France vs Peru match. The highly experienced holding midfielder William Kvist is out of the remainder of the tournament with a rib injury picked up during the first half of Group C opener against Peru. The Ajax midfielder Lasse Schone will be the replacement and is the only expected change for Age Hareide’s men for the second group game. Bert van Marwijk cannot complain the way his men went against France. However, he may need some spark up the attacking front and therefore Tomi Juric can come in the place of Andrew Nabbout. Otherwise, changes are hardly expected to the eleven that performed admirably in the opening match. There were three meetings between Australia and Denmark since 2007. All in friendly games and the games produced a winner. The Danes were lucky twice including their most recent in 2012 by a 2-0 margin. The win against Peru is a lucky one for the Danes, but this will give them huge confidence for the remaining group games. With three points already in their bag, they know they can qualify for the knockouts with a win on Thursday. Australia are a team that love to sit back and observe the pressure and look for occasional openings on the counter. This didn’t help them in creating meaningful goal-scoring chances against France and the lone shot that tested the goal-keeper was the one from the penalty spot. Denmark have a better defensive unit with an exceptional record to go with. The Danes do not score a lot of goals, but one will be enough to see off the Socceroos. Now, Australia had given a lot of dangerous set-pieces away to France. This is where Denmark can be more lethal and this is where the expertise of Christian Eriksen come into play. Christian Eriksen to score any-time @ 3.15 odd.